Popular aquarium fish included within the anabantoid group include Siamese fighting fish (otherwise known as Betta Splendens),Paradise Fish and gourami. What makes Anabantiods fish different from other aquarium fish is that they own a labyrinth organ, which gives anabantoids the ability to breathe atmospheric air. In the wild anabantoids often live in shallow muddy waters, this is why they developed the labyrinth organ. When the water they live does not provide them with enough oxygen they have the option of breathing the air above the water surface. 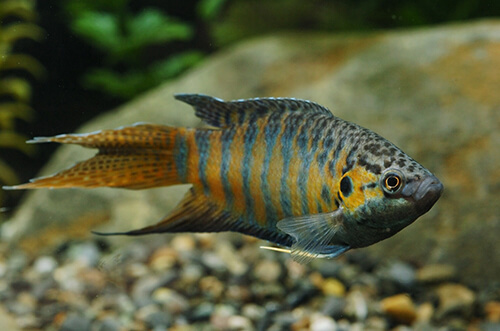 Anabantiods are peaceful fish when keeping a lone fish in a community aquarium, but they can be become much more aggressive when keep together. To witness this next time you see a male Siamese Fighting Fish in a pet shop, watch how it reacts when it sees its own reflection in the tank glass, it will raise its fins and stick out its gills to make itself look bigger. When breeding most anabantoid fish build bubble nests. It is the male of the species which builds the bubble nest. The bubble nest is used to keep eggs safe until they hatch into fry.